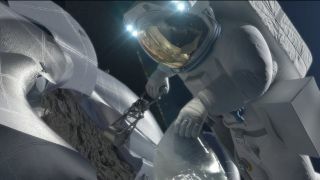 This concept image shows an astronaut retrieving a sample from the captured asteroid. Image released Aug. 22, 2013. NASA's wild plan to capture an asteroid and park it near the moon is only one step on the way to Mars, NASA chief Charles Bolden said Wednesday (March 26). The space agency is planning an ambitious mission to send a robotic spacecraft to an asteroid, bag the space rock and bring it into orbit around the moon. While the asteroid-capture mission may sound like a huge task in its own right, Bolden thinks that it's only one leap toward a larger mission. The space agency should be focused on getting humans to Mars and establishing a presence on the Red Planet for years to come, Bolden said. NASA's ambitious Asteroid Initiative aims to move a small asteroid to a new orbit near the Earth by the year 2025. See how NASA's asteroid capture mission works in this SPACE.com infographic. Though it might not be the ultimate goal, the asteroid redirect mission is still an important step that can be used to test propulsion systems and other technology that could help humans get to Mars. The asteroid mission may also be a good way to gather more information about the early solar system and develop asteroid mining techniques, advocates of the mission have said. "We really make a big deal out of this [asteroid] initiative, but you should all understand, this is a tiny, tiny piece of getting humans to Mars," Bolden said. "I don't want anybody to lose focus on that. The ultimate goal of this agency right now when it comes to human spaceflight is to put humans on Mars. That's hard. That is really hard. We need a proving ground to develop some of the technologies and everything else." That proving ground could be the asteroid capture mission. So far, NASA scientists have identified some promising asteroids that could potentially be captured and dragged into a stable orbit around the moon. NASA would launch a robotic mission to retrieve the chosen space rock and tow it into lunar orbit, where astronauts could visit and sample the asteroid by 2025. Engineers are looking into two different ideas for how the retrieval mission would work. In one mission, the robotic spacecraft would visit a large asteroid and pluck a boulder off of it, bringing it back to lunar orbit. In the other, NASA would target a small asteroid that could be lassoed and deposited in a stable orbit. Scientists have now identified about six target asteroids for each of the missions. NASA officials hope to us the Orion capsule and Space Launch System rocket — both designed to take humans farther into space than ever before — to launch crews to the asteroid. The new rocket and capsule are slated to fly crews together for the first time in 2021. Orion is scheduled to make a test flight later this year.